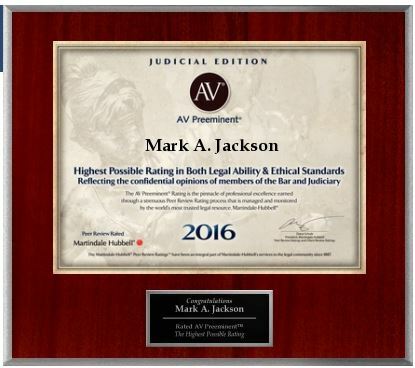 Madison County Personal Injury Lawyer | Mark A. Jackson, P.C. Based in Huntsville, Alabama, Mark A. Jackson, P.C. represents accident victims and their family members in personal injury and wrongful death cases arising from motor vehicle accidents, slips and falls, dog attacks, workplace and construction accidents, nursing home abuse, and defective products. Every year, car and truck accidents on Alabama’s roads and highways cause thousands of injuries and deaths. Although drivers are required to exercise reasonable care behind the wheel, most accidents stem from drivers’ failure to abide by traffic laws and overall poor judgment. Negligent and/or reckless driving includes but is not limited to speeding; disobeying traffic signs or signals; failing to be mindful of motorcycles, bicyclists, and pedestrians; disregarding weather or traffic conditions; and driving under the influence of drugs or alcohol. If your accident was caused by another driver’s negligence or traffic violation, we will help you receive compensation for your economic and noneconomic losses. Alabama law requires insurance companies to provide uninsured/underinsured motorist (UM/UIM) coverage; however, this may not compensate for the full range of damages sustained in an accident with an uninsured or underinsured driver. Please see our page devoted to uninsured/underinsured motorist issues for more information about the circumstances surrounding such claims. Our firm represents people in personal injury claims resulting from commercial vehicle accidents, including collisions with 18-wheelers and tractor trailers. We have significant experience advocating on behalf of clients involved in accidents with semi-trucks, which often result in serious injuries and damage due to the trucks’ weight and size. If the negligence or recklessness of a truck driver or trucking company caused your injury, you may be entitled to recover monetary compensation. If you have lost a loved one due to another’s negligence or wrongful conduct, Mark A. Jackson, P.C. will fight for retribution on your behalf. Under Alabama law, a wrongful death plaintiff may be able to recover damages designed to punish the wrongdoer and prevent similar harm from occurring to others. When you are injured on the job, you are entitled to workers’ compensation. However, many employees have difficulty receiving full benefits from their employers’ insurance companies. If you have been injured or lost a family member as the result of a workplace accident, we can help you obtain the maximum amount of benefits available to you under the law. Property owners have a duty to make their property safe by repairing known dangers or warning others of such dangers. If a property owner breaches this duty, he or she may be considered negligent and may be held liable for foreseeable injuries caused by such negligence. For example, if you slipped and fell because a property owner failed to clean up a spill or put up a warning sign, he or she may be liable for your injuries. Dog bites and attacks can be among the most frightening personal injuries, especially when a child is the victim. If you have been injured by a dog bite, you may be entitled to recover money damages to compensate you for your injuries, including medical bills and pain and suffering. Additionally, victims may need treatment for post-traumatic stress disorder (PTSD) or other effects of experiencing psychological trauma. Construction sites are dangerous environments where accidents often occur. Workers may be injured by sharp tools, loose materials, heavy machinery, and exposed wires. If you were harmed on or near a construction site, you may be entitled to compensation. Federal and state law guarantees certain rights and protects to nursing home residents, including but not limited to the right to be treated with dignity and privacy, protection from abuse and chemical and physical restraints, and the right to receive care ensuring safety and good hygiene. If you fear that your loved one is the victim of nursing home abuse or negligence, we can help you assess the situation and build a claim if necessary. Manufacturers, distributors, and sellers have a responsibility to the consuming public to deliver products that are free of potentially dangerous defects. If producers discover that their product is defective after having introduced it into the marketplace, they have the duty to warn consumers of the defect and fix the problem. If you were injured by a faulty product, and you were using the product for its intended purpose, you may have a products liability claim. Mr. Jackson and his staff are dedicated to helping injured victims and surviving family members recover compensation after an accident. This firm handles personal injury cases on a contingency fee basis, meaning that you do not pay attorney’s fees until you receive compensation. If you or a loved one was injured in an accident or other traumatic event, contact Mark A. Jackson, P.C. at (256)533-5306 or (800)495-5297 for a free consultation.